Rome is an ancient and modern centre of gastronomy where you can find almost anything you like – but four pasta dishes dominate the city. We break down the four classic pastas of Rome with accompanying recipes so you can recreate them in your own kitchen. Rome is a must-visit for any foodie – the city has a long, storied history of gastronomy that stretches all the way back to its imperial days, over 2,000 years ago. As the empire expanded, it amalgamated all sorts of different cuisines and cooking styles, eventually condensing those into what we know as Roman cuisine today. Italian food is sustainable and thrifty on the whole, but food in Rome is particularly efficient. Romans find a way to use every bit of a plant or animal in a meal, and that is especially true of the city’s famous pasta dishes. Drop into any trattoria worth its salt in Rome and you’ll find these four classic pasta dishes on the menu – cacio e pepe, spaghetti alla Carbonara, bucatini all’Amatriciana and pasta alla Gricia. Each is different and delicious in its own way, but they all have something in common – they take a few ingredients, and combine them to create something absolutely delicious. If you fancy making them yourself, read on for a history lesson in how these pillars of pasta came to be, then cook them yourself for a taste of Roman life. 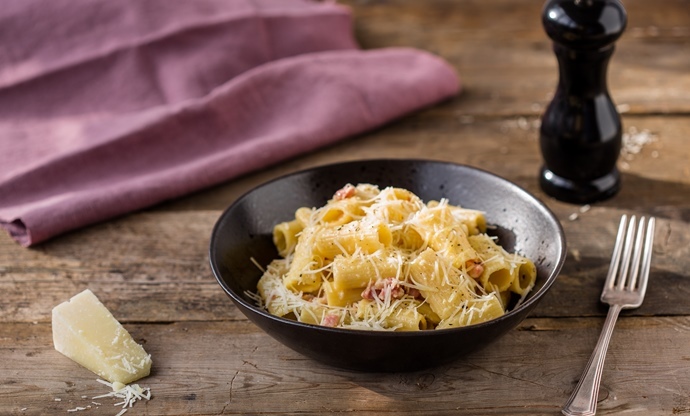 Pasta alla Gricia is the foundation for many of Rome’s famous pasta dishes, but the simple combination of Pecorino Romano and guanciale – a cured pork cheek salumi – forms a delicious dish in its own right. The beauty of guanciale is in the thick layer of fat, which renders and emulsifies into the sauce as you cook it. Start by boiling your pasta, and gently render your guanciale in a pan with a little bit of oil – the idea is to soften it without getting any colour on it. When your pasta is a couple of minutes away from al dente, toss it into the pan with your guanciale. Keep adding splashes of pasta water and stirring to create that beautiful emulsion, and finish with Pecorino Romano. This is often eaten with spaghetti, but you’ll see lots of pasta variations in Rome – it can even be served with gnocchi. Literally translating to ‘cheese and pepper’, cacio e pepe has become a staple of restaurant menus and student dinner parties everywhere thanks to its simplicity. Although it only consists of pasta, black pepper and cheese, that doesn’t mean you can’t get it wrong – it’s very easy to end up with a clumpy mess. 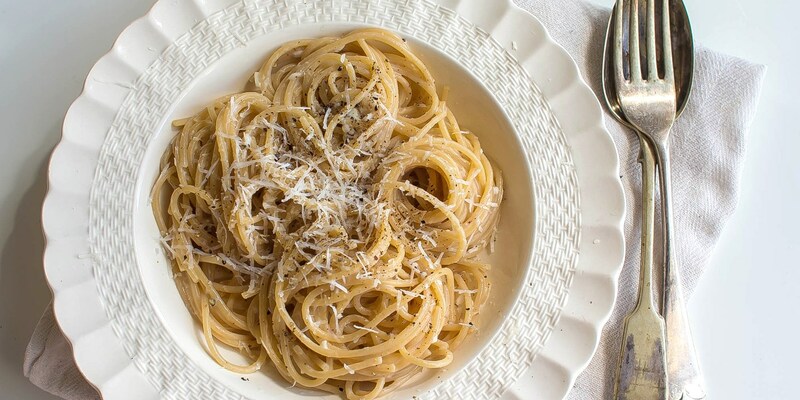 Cook your pasta a few minutes short of the recommended time, then finish it in the pan with a ladle or two of the pasta water, plenty of black pepper and Pecorino Romano. Keep stirring the sauce and you’ll release starch from the pasta as it finishes, giving you that lovely thick, glossy sauce at the end. 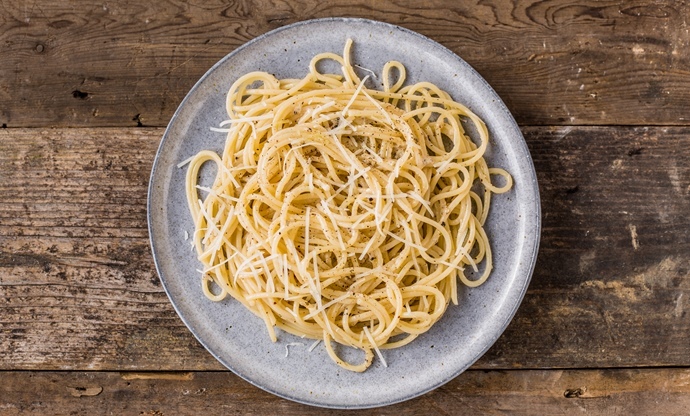 Although thick, hand-rolled pici has become a popular way of eating cacio e pepe, but in Rome they’ll often use tonnarelli – known as spaghetti alla chitarra outside of Rome (particularly Abruzzo). Normal spaghetti is absolutely fine to use if you can't find these more specialist shapes, however. The most famous of Rome’s four pasta sauces, the origins of carbonara are much disputed but one thing is for certain – it’s absolutely delicious. 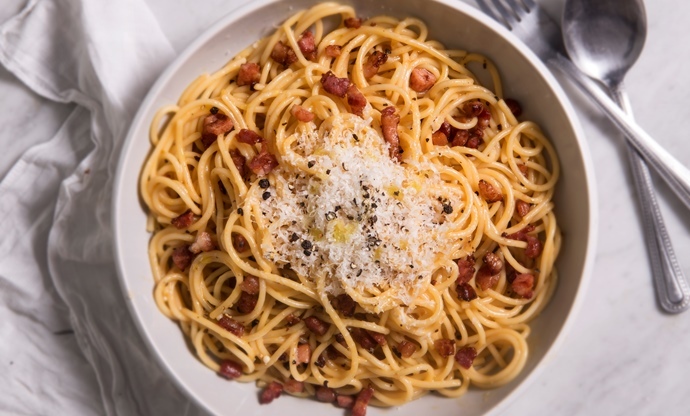 The original recipe has been adapted (Italians would say bastardised) by cooks around the world, and you'll find a variety of different ingredients used, from bacon lardons and pancetta to double cream, onions and Parmesan, but if you want to make a true Roman Carbonara you only need four things – guanciale, eggs, Pecorino Romano and black pepper. It is, in effect, pasta alla Gricia, but with eggs added for extra richness. Start as you would for Gricia by rendering your guanciale and cooking your pasta – spaghetti is common in Rome but you can use any other pasta you have – then mix your cheese and your eggs and use with your pasta water to gently emulsify your sauce. Amatriciana is another riff on pasta alla Gricia, thought to have originated in the Lazian town of Amatrice in the late eighteenth century. 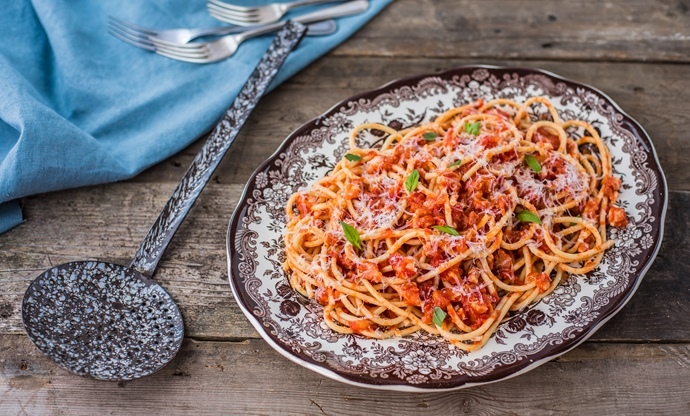 As tomatoes became more common and less of a luxury item, Italians started to use them increasingly in everyday dishes, and Amatriciana is a good example of that. The base is prepared in the same way as pasta alla Gricia with guanciale rendered in a pan and pasta cooked just short of al dente. Tomatoes and pasta water are then added to the guanciale, cooked through and stirred to make a sauce, then tossed through with pasta and finished with a handful of grated pecorino Romano. Unlike the other three where cheese is a more prominent flavour, here it is more of a binding agent to help emulsify your sauce. Bucatini is normally used to make pasta all’Amatriciana in Rome, but rigatoni works well also. Our recipe adds white wine for extra richness and depth of flavour.